Vintage design holds a half gallon of beer! Drink boldly with the Mason Jar Beer Stein. The vintage design of a mason jar has been paired with the large capacity (and large handle!) of a proper beer stein for Oktoberfest-style drinking anytime of the year. 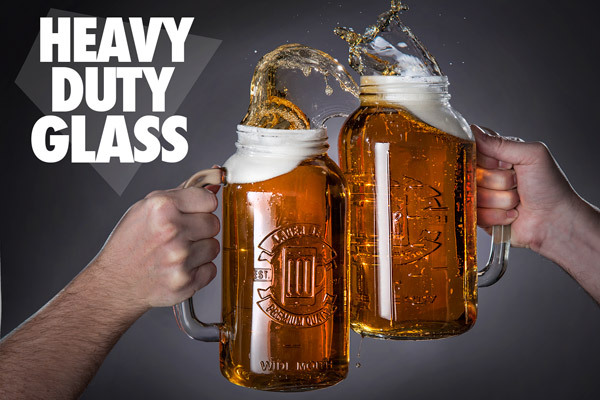 Made from real heavy duty glass, the Mason Jar Beer Stein boasts a capacity of 64 ounces (that's a half gallon!). The dishwasher safe beer stein features imprinted measurements in both pints and liters. Dimensions: 9.5" x 6" x 4.5"
Behold the minotaur of beer-drinking vessels! 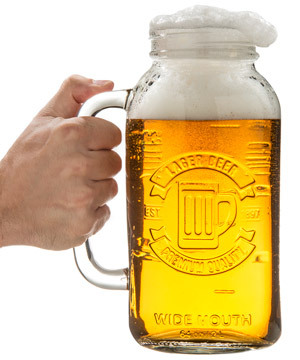 The Mason Jar Beer Stein has the body of a mason jar, the usability of a beer stein, and a half-gallon capacity! As you're probably well aware, we love large and odd-shaped beer receptacles, so we're absolutely smitten with the über sturdy Mason Jar Beer Stein. The amazingly large Mason Jar Beer Stein holds 64 ounces of delicious beer. So heavy you can work out while you drink! Completely empty, the Mason Jar Beer Stein weighs about 3 pounds. 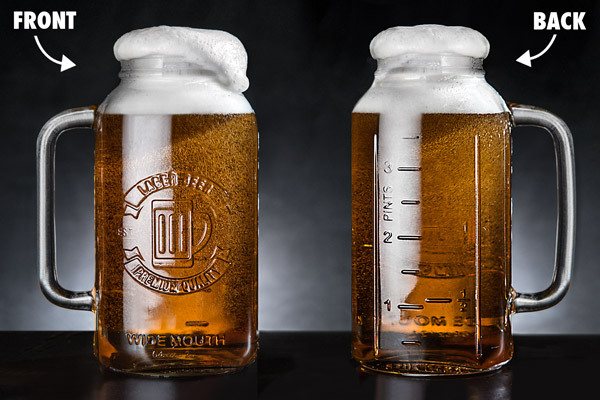 When filled to the brim with a light lager, the Mason Jar Beer Stein would tip the scales at approximately 6.5 pounds! So, let's break this down a bit further. Let's say that there are 50 sips of beer in your completely filled Mason Jar Beer Stein. That's 50 reps at an average weight of 3.25 pounds per rep. Thus, in the 5 minutes it took you to drink that beer, you lifted 162.5 pounds. I think this kind of workout qualifies for a cheat day! The Heavy Duty Mason Jar Beer Stein weighs over 3 pounds empty. While we prefer to hose out our massive beer-drinking vessels, the slightly more refined crowd will be pleased to know that the Mason Jar Beer Stein is dishwasher safe. 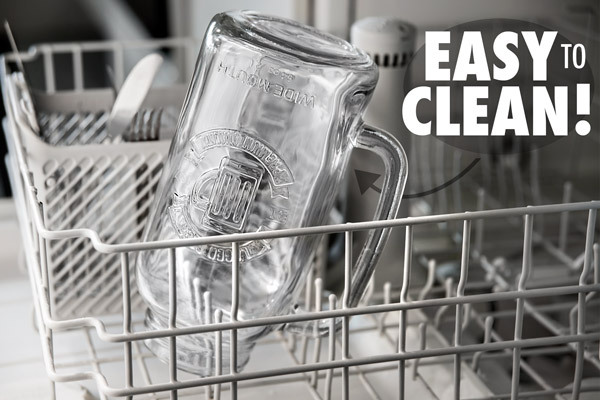 When the party finally winds down, clean your Mason Jar Beer Stein in the dishwasher. While the front of the Mason Jar Beer Stein features the imprint of a beer-themed logo, the back provides markers delineating pints and liters (both in half-pint and half-liter increments, respectively). The rear of the Mason Jar Beer Stein features markings for pints and liters. 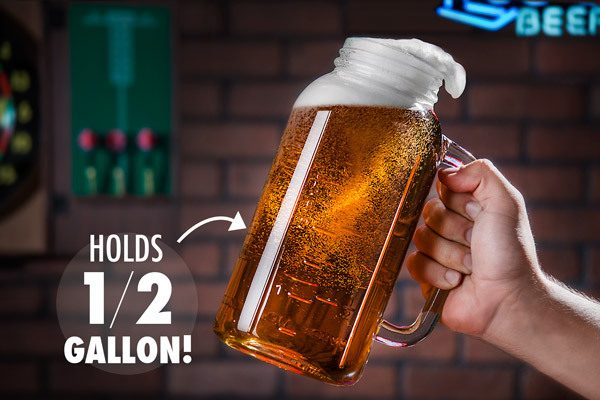 Question: Can it hold other liquids beside beer? Everything you need to transform liquor into a cocktail.